Blogging always gets a little hectic around January- don't you think? Everyone's resolution is to blog more. It's great! 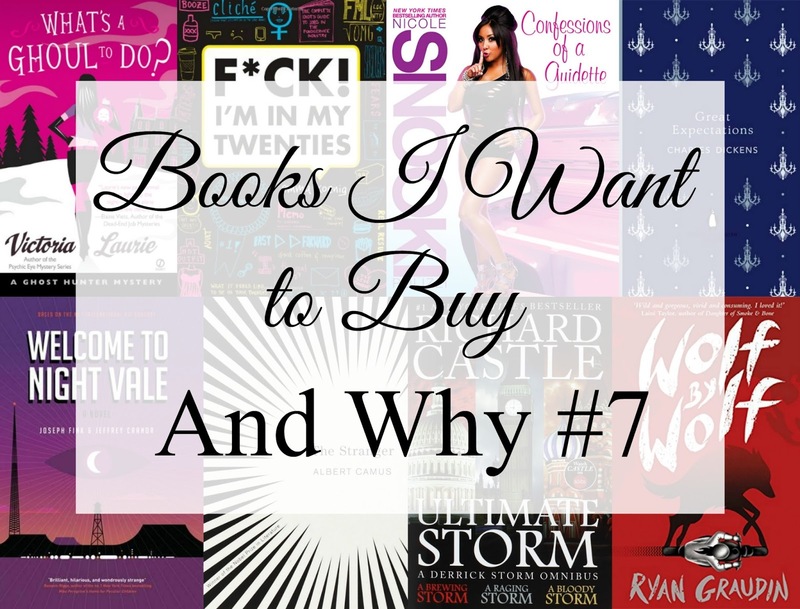 But I think I've finally finished all my New Year type posts so I thought I'd jump right back into normal blog mode with the 8th post in the Books I Want to Buy and Why series! So- what are today's choices? I saw this series in a picture on bookstagram but I can't for the life of me remember who posted it. I finished the Sookie Sackhouse series in 2015 so I'm looking for a supernatural mystery type series to fill the gap. This looked like it might. It's about a medium who helps souls cross over, sounds promising! How am I nearly 22? How did this happen? I don't know how to do such basic things. I don't know how to cook an egg! As always, I start feeling a little stressed when my birthday approaches. I'm not a birthday fan. But I am a fan of any journal-type-thing that apparently mentions fanfiction. Yeah, I found out about this on Tumblr. We know by now that I love Snooki. One of her other books has already popped up on another Books I Want to Buy and Why post. This is her second book, (I've reviewed the first one) and is a memoir/guide rather than fiction. I personally love Jwoww's The Rules According to Jwoww so I have high hopes for Snooki's version. Another Penguin English Library, I know, but how have I got to 21 and never read Great Expectations? This feels like one of those books that I really should have read by now. Or at least own so I can pretend that I'm going to get around to it soon. In fact, the only Dickens I've read is A Christmas Carol. Not great, Imogen. I've been listening to the Welcome to Night Vale podcast for years now and I really enjoy it. I even saw it performed live in September of last year. So when I heard that they were putting out a book, I was intrigued. I can't decide if I should get the hardcover or the audiobook, but since I'm behind on the podcasts, the physical copy is probably the best bet. A while ago I was scrolling /r/books and found a thread about books that helped people out when they were depressed. Someone said; 'After months of depression, The Stranger taught me to stop giving a f*ck.' It's recommendations like that, that make you sit up and pay attention, so on the wishlist it went. Pre-show Castle wrote a series about a man named Derrick Storm. He dies in the book presented in the pilot episode but turns out- he's alive and back in this collection of three stories. I have the graphic novels about Derrick Storm and I'd like to add this to my Richard Castle collection. I'm a marketing persons dream. I read The Walled City by Ryan Graudin in March of last year and really loved it. I was immediately looking up more of her work, to find that this was coming out in a couple months. But since I'm mainly a paperback collector and I have The Walled City in paperback, I'm waiting until May for this I think.